Amazon has unveiled new e-readers and tablets on Thursday -- the biggest surprise to analysts was a $US499 Kindle Fire HD 4G LTE tablet. The 8.9-in. tablet comes with a 4G LTE wireless data package that costs $US49.99 a year for 250 MB of data a month, 20 GB of cloud storage and a $US10 Amazon AppStore credit, Amazon CEO Jeff Bezos said. The Fire HD with 4G LTE will come with 32 GB of storage and will ship Nov. 20. The LTE radio chip inside the tablet will work across all 4G bands, Amazon said. The $499 tablet was the biggest surprise at the launch because Amazon had previously focused on lower-priced hardware, such as the $US199 Kindle Fire launched about a year ago, analysts said. "With such a big price jump, Amazon is saying that this is not a wireless device for the sake of just wireless, but it is testing the relationship it will have with carriers" and the market at large, said James McQuivey, an analyst at Forrester Research. "The $US499 product means that data plans are a part of Amazon's future, which also might suggest they will produce a smartphone too," he added. It was widely rumored that Amazon would at least show off a smartphone prototype today, rumors that proved false. The $US499 price is the starting point for the highly popular Apple iPad. Bezos said $US499 is the most "popular" price point for a tablet -- probably because the iPad is the most widely purchased tablet. He said that Amazon decided to focus on what its designers could put into a device for $US499. The answer, Amazon decided, was 4G LTE wireless-- "the ultimate tablet feature." McQuivey said the $US499 price is also an indication that Amazon "had to raise the hardware price" in light of Apple's prices, despite Amazon's constant refrain that sales of content and services through its online store can offset razor-thin profits, or even losses, on hardware sales. 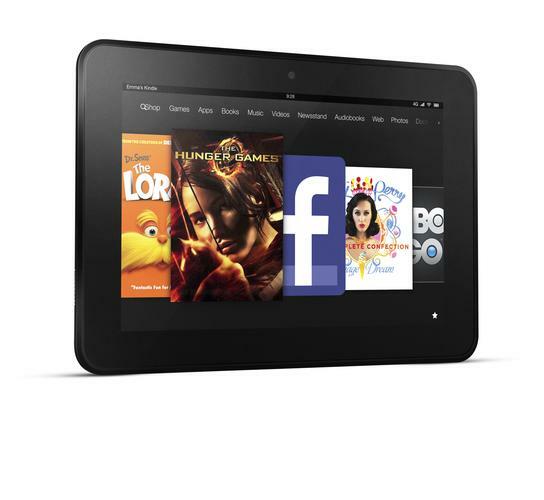 The original Kindle Fire recently sold out after less than a year after it started shipping. Sales of the device were in the millions, and took a 22 per cent share of the market, Amazon recently said. The Kindle Fire components cost about $US199, the same as the list price, according to independent teardown analyses. The value to Amazon has been in online goods and services such as its Prime membership for $US79 a year that allows borrowing of e-books, instant streaming of movie and TV shows and free shipping of products sold via Amazon.com. While Bezos announced the higher-priced $US499 Kindle Fire HD with 4G LTE at the event, he also called attention to the Amazon's focus on selling services to customers, not just hardware. "We want to make money when people USE our devices, not when they BUY our devices," said a slide posted behind him as he spoke. Bezos clearly had Apple in its sites with the $US499 device, especially with his claim that a first-year cost of the device, plus a $4US9.99 service plan, would be $US549, compared to his estimate that the iPad 3's first-year cost with 4G service is $US959. Amazon also notes that it's selling devices at a variety of price ranges and sizes. The all-new Kindle Fire HD 7-inch model will sell for $US199 over Wi-Fi, while the Kindle Fire HD 8.9-inch Over Wi-Fi will start at $US299. Meanwhile, a new-generation Kindle Fire with a faster processor and twice the memory of the first one will sell for $US159. Jack Gold, an analyst at J. Gold Associates, said buyers of the LTE-ready Fire will be forced to manage their usage carefully if they want to stream video over LTE, since they are limited to 250MB. "LTE is becoming a "must have" for a bigger group of consumers, so it may be more about Amazon addressing market desires than really having LTE as a feature set." Gold said. "The vast majority of users only deploy tablets over Wi-Fi anyway. If you're going to build a 'Cadillac' device, then HD, LTE and great sound are required by market pressures," he added.